I am disabled. Thank you for your assistance. If you receive Disability Living Allowance at the higher rate for mobility you could use all or part of it to obtain a scooter through the Motability scheme (www.motability.co.uk). AFTAID (www.aftaid.org.uk) This charity provides grants to individuals over retirement age and on low income. I suffered a stroke in September 2011. Since returning home in February 2012 my mobility has been seriously restricted, effectively restricting me to the house. If i had a mobility scooter, I could at least get out to visit people within my own village. Is there anywhere I can turn to for assistance in obtaining a scooter? Hi do have a look at the links mentioned above. Another source of funding might be smaller charities in your local area. You should be able to get details of these from your local library. There are also a number of companies who hire out mobility scooters on a contract basis. Hi, I have a 7 year old daughter who is fully wheelchair dependent and we are now in need of a van with a ramp now due to the fact she is to big to keep lifting in and out of the car now. Myself and my wife have been looking online for vans with ramps as our 7 seater car is just no good for us any more but the addapted vans are realy expensive. Does anyone no any charities that help out towards motability vans that have been addapted? Depending on your family income Motability might be able to help you. If your daughter is eligible for the scheme you can apply to their Grant Department. The grant will pay for the downpayment on the wheelchair accessible vehicle. Hi, I have Parkinson's and except for doctors appointments and hospital specialists I'm house bound. I have a car on mobility but I can`t drive it my licence was revoked so my son uses it for my appointments. 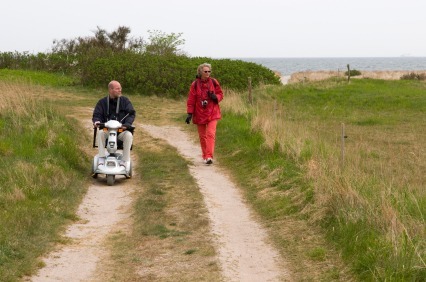 A mobility scooter would mean so much to me as I could go out when I want and not have to ask anyone. Its depressing being in the house so much. I value your advice. Thank you. Hi you have a couple of options. Firstly as you qualify for the Motability scheme you could use this to obtain a mobility scooter but it will be instead of your car. If you need a powered wheelchair or scooter and are not eligible for statutory help or afford to purchase for yourself please write to Mobility Trust at 17b Reading Road, Pangbourne, Berkshire, RG8 7LR. They provide the equipment along with extended warranty, insurance and 2 annual services in most cases. If you would like to talk to them first please ring 0118 9842588.